Hello There. 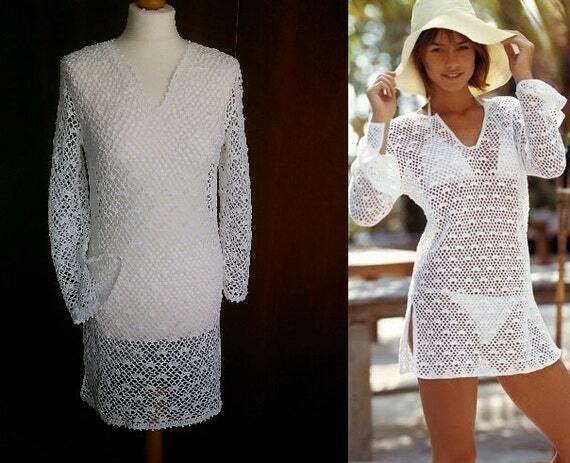 I added your Etsy shop item to my blog post – crochet white tunics. Please feel free to share it with others and through your favorite social networks. Use the share bar above or below this article. Do you want your Etsy shop listing to be featured next? Leave me a comment. What a better way to celebrate the tunic crocheted. White is a fresh and clean color. Wear it over swimwear for the summer. A tunic is a loose garment, typically sleeveless and reaching to the wearer’s knees, as worn in ancient Greece and Rome. Anyone who wants to hide their figure completely with a non see-through or see through fabric. It reaches down to the hips, knees, or ankles. It is practical for multi layers if desired. Vintage crochet long tunic, bohemian style. Hippie mini lace dress style Stevie Nicks festival boheme clothing. Beach dress Gypsy Boho.